Do it. I've been thinking about this concept for a while after hearing on a cooking show that you can crumb meat in basically anything. Two thoughts popped into my head 1) crushed up Cruskets for fish or chicken and 2) crushed corn chips to coat chicken or beef meatballs. I believe though that pork would happily work as well. Easy as and full of flavour. The corn chips I went with here were nacho cheese corn chips which are covered in powdered cheese so I cooked them as small balls at a medium temperature to stop them from burning. If they were much larger they definitely would have burnt. I happen to have a decent 'Tex Mex' seasoning at home, taco seasoning would do but if you don't have either - its fair basic, just use a little powdered cumin, paprika, salt and coriander to taste. Want more, make a larger batch. Combine the mince, seasoning, garlic and coriander well in a bowl. 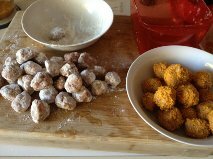 Make small meat balls and dust with the flour. 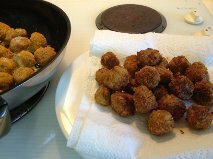 Pass the meatballs through egg and then through the blitzed corn chips, coating very well. Blitz more corn chips if necessary. Shallow fry in the olive over a a medium heat, turning until you have great colour all over. Remove to some paper kitchen towel to drain then serve hot. I served mine with a simple tomato sauce and some guacamole but salsa or bottled tomato sauce would also work well.